John Archer designed and line engraved the stamp's central motif on steel, a portrait of Jefferson Davis. The engraving was then transferred to steel printing plates. This is the same engraving as the “Frame Line” issue but without the frame lines. Based on incomplete records, it is estimated that 47,611,000 were printed for 11-AD and 12-AD from two plates, each with two panes of one hundred. There are numerous imprint varieties of “Archer & Daly, Bank Note Engravers, Richmond, Va.” (AD) The inscription was altered over the life of the plates. "Daly" was removed first, and later the entire imprint was removed. For a complete list of the various imprint states, consult the 2012 CSA Catalog. Full sheets of two hundred and panes of one hundred are known. The earliest recorded date of use is April 21, 1863. Colors vary from blue to milky blue, dark blue, and greenish blue. There is also a cataloged green shade but should not expect to see the green shade as printed on CSA 13. It is a confusing shade to even serious students. Authentication is recommended for comparison against the accepted standard of green for this issue. The most typical use was to pay the ten-cent letter rate. An unknown number of sheets were perforated in gauge 12 1/2. This perforation experiment proved impractical, but the perforated stamps were released for use. It is theorized that in 1864, when Union forces threatened Richmond, the Confederate government moved the production of stamps and currency to a safer city, farther south. Others have concluded that the cause of the move was simply contract disputes. The four 10-cent plates, two each for Types I and II, were released to Keatinge & Ball of Columbia, South Carolina. (KB) Keatinge & Ball printed and supplied stamps until the end of the war. The Archer & Daly imprint was removed from the plates, and an imprint with the name of the new contractors was substituted. No other changes or retouching occurred. Based on incomplete records, it is estimated that there were approximately 15,125,000 for CSA 11-KB and CSA 12-KB, each with two panes of one hundred. At least a portion of the last Archer & Daly imprint was still on the 10¢ Type II plate when Keatinge & Ball began printing from it. Later, the Keatinge& Ball imprint, "Keatinge & Ball Bank Note Engravers, Columbia, S.C." was added. The existing Archer & Daly plate numbers remained. This only came to light in recent years when I noticed a partial Archer & Daly imprint strip with all the classic characteristics of Keatinge & Ball printings. Since then, this has been verified with scientific analysis and a number of other copies have been found. As more Confederate students become aware of this, undoubtedly more will be identified. The Keatinge & Ball printings can generally be recognized by the darker colors, generally inferior printing, and distinctive molasses-colored gum, which was laid on thickly and unevenly, creating streaks. The ink was applied with a heavy brush, which tended to blot-out background details such as the shading around the portrait. Overheated printing plates added to this. The shading frequently appears solid instead of cross-hatched, as on the Archer & Daly printings. Conversely, chilled printing plates produced a mottled look with a lack of detail. 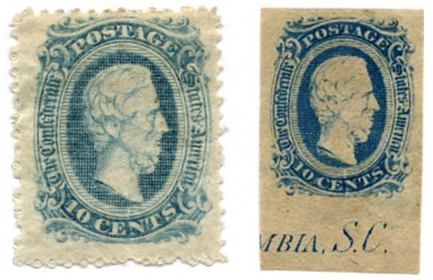 Printing of the Keatinge & Ball stamps ceased on February 17, 1865, when Sherman's army captured Columbia, South Carolina.